« Hottest day for 9 years. I have been using the Bayer Contour Next for a short while and just thought I would share my early thoughts on it before I next try the Bayer Contour Next USB which looks very compact J. I have used the Bayer products for a long time now and always been very happy with the design/technology and support they offer, I tend not to use the software to its full potential but moving forward the Bayer Contour Next USB it will be far easier and my ultimate goal is to get the Medtronic 640G Insulin Pump which works in conjunction with the very New Bayer Contour Next Link products so what this space. The Bayer Contour Next now tests the blood sample 7 times before it reports the results. The meter is very easy to use as with most of the Bayer range and has a superb size screen for my personal needs, as always fast results and a huge memory. The Bayer Contour Next comes with a fairly good finger picker but moving forward it would be great to see some more technology from all the Diabetes Companies in relation to getting that frustrating droplet of blood from your finger, possibly like me you text many times per day and it really does take its toll on your fingertips – surely there is another answer out there ? The Bayer Contour Next also has a more in depth software program which I am still getting used to for editing your readings and doesn’t require that you download the Glucofacts software program which is a real plus so you can just plug it into your USB port. Thanks for reading and I would certainly recommend giving this meter a try. 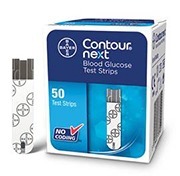 The CONTOUR® NEXT range of meters all utilise the CONTOUR® NEXT test strip and have demonstrated they deliver exceptional accuracy for results you can rely on, to help you make better diabetes management decisions.